Having trouble distinguishing between evidence and faith? Have you been caught off guard while witnessing when atheists use these terms? Read Paul Taylor&apos;s Evidence vs. Proof eBook which clearly differentiates the truths of each, and how to best use them to defend your faith in our Creator—GOD! 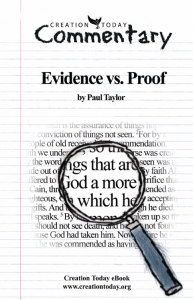 At the successful Proof of God Conference in October 2012, Paul Taylor delivered a message on the biblical use of evidences in presuppositional apologetics. In this Creation Today Commentary, Paul has committed these thoughts to an eBook. This makes an excellent companion to the Proof of God Conference DVD set, serving as a handy reference and review for those who attended the conference, an informative guide for those who could not attend, and as paramount study material for the serious apologist.